Potato frankie or wraps are rich in potato and cheese. If you are in diet then not a good choice, it is full of carbohydrates. I love eating this yummy potatotious roles 🙂 You can see frankies from 5 star hotels to street. But the best frankie I had was from a street food vendor in Bangalore. Today I am sharing my version of potato frankie with a little bit of Indian spices in it. I have shown the two ways of wrapping the role in this picture. Mix all purpose flour and wheat flour with water. Kneed the dough and keep it aside. Take a frying pan add capsicum and finely chopped half onion, garam masala and fry it well with a tbs of oil. At the end add cheese and take it out. Add red chilly powder,amchur powder and coriander leaves,mix well. Stuffing is done. 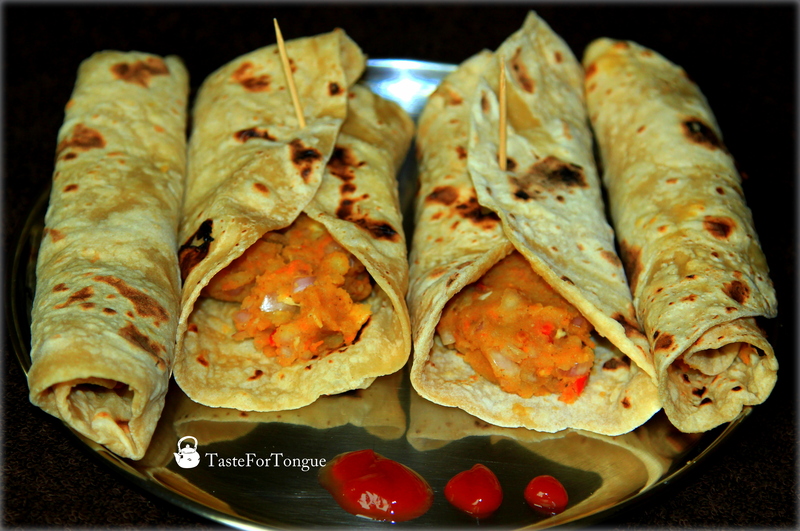 Now take the dough and prepare rolls and pan fry them with out oil as you prepare rotis. Make sure that the rolls are not thick.